Since Obama took office in 2008, he has set aside more than 550 million acres in two dozen monuments — the most of any president in U.S. history. Such wanton disregard of local economy has become a legacy of disparity and despair, nothing a President should be promoting. The campaign driven by the Conservation Lands Foundation over the past two years to designate the Bears Ears in Utah as a National Monument has promoted Disparity, Discrimination, Deceit, Divisiveness, Disillusionment, Dissembling, and Debt. There is a huge disparity between eastern states who have large amounts of private land and thus the wealth, and most western states who have low median incomes and little private land. There is a correlation between private land and wealth. Former San Juan Commissioner Bill Redd often stated, “The wealth of a people, or a country is always linked to land.” 75.2% of Utah’s land is public. Only 24.8% is privately owned. Only two other states in the nation have more public land than Utah – Alaska and Nevada. Our neighbors in Colorado have twice as much private land – 56.7% and their public land is 43.3%. San Juan county has an even more dismal ratio– 92% of the land is already public and is managed by BLM, Forest Service and five existing parks, monuments, and reservations. This is why this is a poor county. If the option of “multiple use” would locked up by a National Monument, thus locking up jobs that foster self-reliance and freedom from debt, thus there will be even more disparity. Since Obama took office in 2008, he has set aside more than 550 million acres in two dozen monuments — the most of any president in U.S. history. Such wanton disregard of local economy has become a legacy of disparity and despair, nothing a President should be promoting. There exists not only discrimination in the United States between those who have private land and those who don’t, it also exists when citizens live in areas where they are prevented from using initiative and free enterprise to earn a better living. Wealthy lobbies have poured millions into Obama’s environmental campaign for more monuments, which increases the disparity between the haves and the have nots. Other rural areas fighting this same “Folly Green Giant” have the same disadvantage. Though San Juan County is rich in land, it is ranked 29th out of 29 Utah counties based on per-capita, annual income. Another layer of discrimination appears when schools become underfunded or under achieving because of environmentally imposed restrictions on lands which can no longer provide funds for school children. San Juan County’s tax valuation which determines budget decisions, is based on roughly 20 companies. All but two are tied to the land. Even Verizon, which is a leading cellphone provider, is tied to the land. That is why sections of San Juan county land must continue to be multi-use. Ironically, some areas in the proposed 1.9 million acres do NOT even meet the definition of “public lands.” This includes 43 grazing allotments, 661 water-right infrastructures, 151,000 acres of state trust land, 18,000 acres of private property, and hundreds of miles of roads and infrastructure which are granted a RS2477 right-of-way. The Environmental Lobby Discredits State Sovereignty, laws, and freedoms. It makes Utah sound like a thief when congressmen and state officials take a stand to protect and use SITLA lands which are scattered throughout the proposed area. Merri Shumway a SJC school board member explains: “Four sections of every township was designated at statehood for the purpose of supporting public schools. The State Institutional Trust Lands Administration (SITLA) has the responsibility to manage these lands that are in trust for school children in the state of Utah. The lands that do not have the potential to generate revenue are sold off or traded for land that can produce revenue to support public schools. When land is sold, the money from the sale is deposited into the Permanent School Fund. Interest and dividends from the fund are distributed to each public school in the state of Utah each year. Community councils that consist of school faculty and parents of students attending the school make the decision of how the SITLA money is spent.” Those pockets of state land need to be utilized for the benefit of local schools. The Environmental Lobby is Dishonest. The tribal coalition organized by the Conservation Lands Foundation, is not a grass roots effort as advertised, but is planned, paid for, and orchestrated by behind the scenes wealthy millionaires, such as Hansjorg Wyss. According to Dave Skinner a Montana writer, Wyss has done more than any other man in the world to bring rural states to their knees by donating millions to environmental campaigns. The PEW Foundation, Hewlett-Packard, and dozens of other foundations get tax benefits for donating to environmental causes. Their $$$ has created a huge slanted campaign for more land. This Green Machine uses scare tactics and hyperbole as it exaggerates what is happening and what will happen if a monument is not designated. Overused phrases such as, “rampant looting” and “desecration of land” has caused environmental hysteria and misled thousands of people who do not see the true picture. By up-playing negativity without giving actual facts, the nation has been led to believe local people don’t care about the land. Nothing could be further from the truth. Good citizens have been protecting this area for generations, but there will always be those who are up to no good, just as occurs in cities on the east and west coast. Establishing a monument will not stop that, and in addition increased visitation will only bring more vandalism while eliminating traditional uses. This has occurred in Grand Staircase Escalante since it’s designation 20 years ago, and we have no reason to believe it will be different here. A recent incident in the Bears Ears area of Comb Ridge was caused by Fort Lewis College students who were supposedly supervised, and educated. They didn’t just leave footprints, but graffiti. This paradox plagues every preservation effort. In order to protect special places, advocates must get public support. To do that, they need to let the public know why the place is so special, to let the masses in on their secrets. Such a campaign acts as a travel council publicist with many of the same negative effects. Whether it is outright deceit, or poorly studied economics, the Folly Green Giant, has also promised Native people that there will be new jobs through tourism and “Industrial-strength recreation” (see recent article in Canyon Zephyr by Jim Stiles.) This dangling carrot strategy would replace ranching and fossil fuel industries in SJC, yet expect people to drive hundreds of miles to get here while utilizing their smart phones and gear which is at least partially dependent upon fossil fuel products. Read more about the hazards of Industrial-Strength Recreation in the newest Canyon Zephyr. The CLF strategy of forming a native coalition has ended up dividing tribes and sometimes families. Strategists never made any effort to inform tribal members, but instead gathered consultant/leaders. It makes one question why they so readily joined this crusade, when they have much to lose? There must be thousands of tribal members both in and out of Utah who have no idea what Bears Ears is all about. Yet supposedly 5 tribes endorse it. Commissioner Rebecca Benally warned early on, “Trusting the federal government has historically resulted in broken promises for Native Americans. As native people in Utah started investigating what was at stake the tables turned and coalition members of the Ute Mt. Leadership were voted out of office as a result. Another D goes to Dissembling or pretending to support one idea, when in fact you support a differing philosophy. Many of us heard Navajo leaders speak passionately against oil drilling at the Sally Jewell hearing in July, yet ironically the Navajo tribe is in the process of trying to by Resolute Oil, the #1 tax payer in San Juan County. So obviously, it’s not the issue of owning an oil company or drilling that is the problem, but who gets the benefits from it. This certainly sends a mixed message from the Navajo nation. The Nations $20 Trillion debt has put all of us in debtor’s prison. We are being held hostage by land collateral. We have given away our birthright. We see the results of national debt when existing National parks and Monuments are put under a two-year deferment. Thirteen of Utah’s parks are hampered because of no maintenance to the tune of $278,094,606. The maintenance deferment nationwide totals $ 11,493,168,812. The federal government is not taking care of needs. This further illustrates government inefficiency; as a nation we cannot continue to spend money on wants. We must focus on needs. Leave San Juan lands managed as they are with an emphasis on cooperation and community/county-wide efforts to protect and live in hoz ro’. 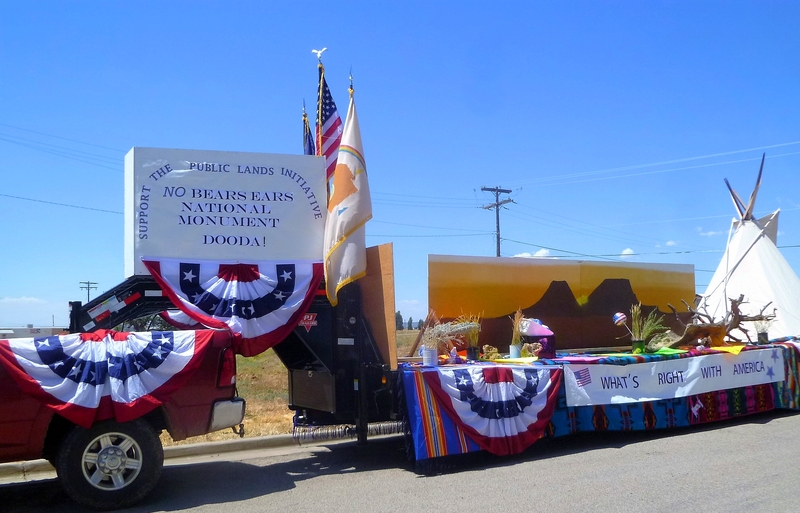 A National Monument is not the answer to peace and protection in San Juan County. By working together, we can eliminate those D’s. It is also interesting to note that Sally Jewell stated that there will be no co-management. And Davis Filfred, Navajo Nation Delegate, pushed a policy through the reservation government that allows for fracking almost anywhere.